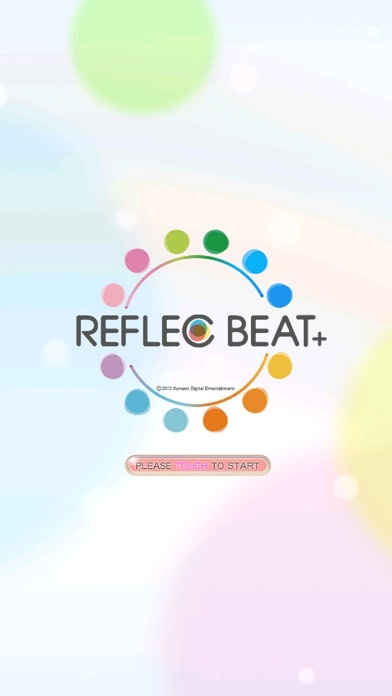 REFLEC BEAT + is a new type of rhythm game where you tap moving objects in time with the beat to battle it out with your opponent for the highest score! 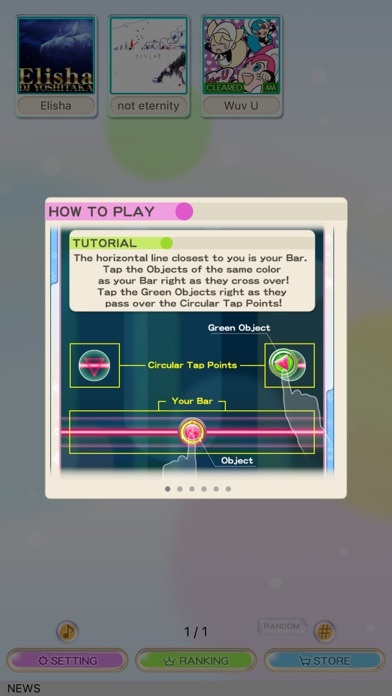 Earn points by tapping the bar at the exact time the target objects pass over. The better the timing, the higher the points! When the song is over, the player with the highest score wins! Keep a lookout for additional, familiar favorites that we'll be releasing through updates! If you use the same account (Apple ID) on multiple devices, you can download previously purchased song packs to those devices with no additional charge. I love this game. 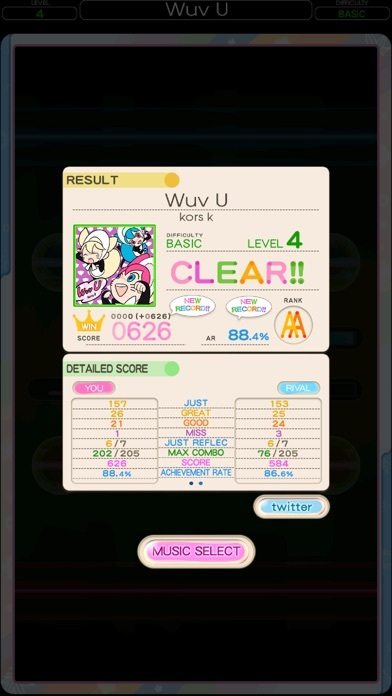 Hope someday Konami will update Japanese songs for US’store. Its to hard to puchase game in JP Appstore. After the most recent update, I can no longer download the music packs I already purchased. It is as though the company “took the money and ran”. Really hope a fix is coming soon. There is no introduction or tutorial for new players. After finding a hidden "How to Play" menu, you are then shown a bunch of pictures with rules. It's like having a game throw every rule at you at one time, before you even play. My next main problem with the game is the purchasing of song packs. There's no reason to have to have to buy these songs in packs of 4 which are pre-selected. Often there's only 1 song in the pack I like, but I'm not about to spend $4 on one song I want! This game is great!.... if you have the money to buy any good songs. This app gives you 3 free songs :/ there is no point to a free game that requires money to play. I've played this game for a while and I'm so glad it's on iOS now! I was able to redownload all my purchased songs with no charge so not sure what the others here are having issues with. Great game :)! This is easily one of the best music game apps available on iOs. I especially love the fact that it supports offline play, which amazingly, many music game apps so not. The local multiplayer option is also a lot of fun, and the music selection is pretty great - I just wish they updated it more often. For those of you who had your scores/purchase history wiped out in the latest update, try deleting the app, re-installing it, and pressing the "Restore Purchases" option in the store. I can't guarantee that it will work for you, but it definitely worked for me! 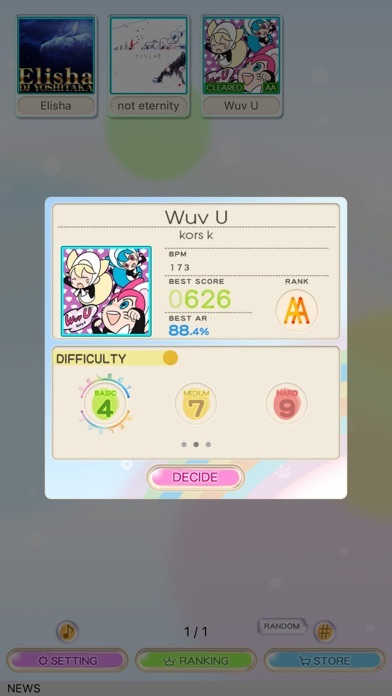 I actually like playing this game, until Konami decided to not allow me access to the songs I purchased prior to the update after I updated the app. 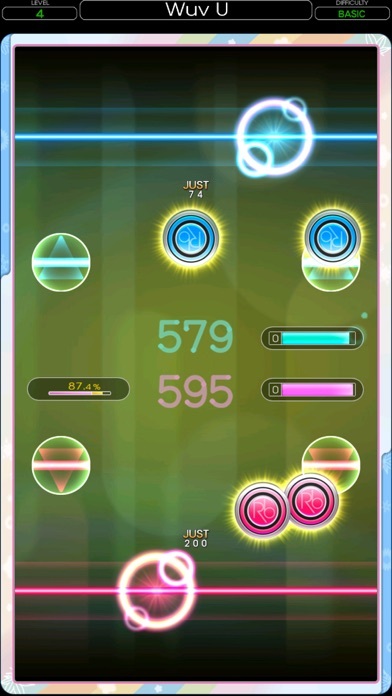 As a rhythm game professional, I rank the game six out of ten. The game is fun, but lacking. There is a computer opponent at the top of the screen, making it almost necessary to have same-device multiplayer. The good: The game is very entertaining and addictive, giving little tutorial so players can figure out the controls. The bad: There is no same-device multiplayer. There are only three free songs, this would be acceptable if the song packs were a little less pricey. Take Osu! for example. There are about seven free songs with new packs costing ninety-nine cents. The packs here cost near four dollars. I really wish I could give this a five out of five. But the bad is a little too noticeable. If these things are changed, this could be a very popular game. Game is fun, but buying songs cost alot, just play it in the arcade at like round one or somthing, if you want other music games play VOEZ,DJMAX Ray,Deemo,Cytus,Hachi Hachi. But you could just go to the arcade and play it but hey its decent.